Downtown Toronto is the busiest area for Uber Drivers. Since downtown Toronto is main hub for night life, consists many clubs and bars. Weekend nights are always busy in downtown Toronto. There are some drivers that they give up on driving for Uber in Toronto. But others have found the way to maximize uber earning. There are some drivers who drives on weekends and cash out big amount. In this section we will share some techniques and ideas that how you can increase you earning, tips, efficiency and earn like a professional driver. Uber surge is a great way to maximize uber earning. When there is a high demand of rides from riders and fewer drivers are available then Uber start surging the area. Because Uber want to encourage the drivers to drive, so passengers don’t have to wait long enough to get their rides. Eventually drivers make more money because of surge price and stay longer on the road. In Toronto especially downtown you will always get surge price in the morning and afternoon, usually working hours starting and ending time. Below are some of Uber surge areas of Toronto, Ontario. The surge price is different from area to area, as red layers on map go darker when increase surge. It could be from 1.5x to 2.5x, drive in surge area to maximize earning. Furthermore, in downtown Toronto weekend nights around 2am you will always get surge price. Try to drive in that timeframe, simply make similar trip into double amount fare and so on. Important: Don’t chase the surge pricing. For instance, you are in the north of 401 and you see the south side of 401 is surging. Therefore you start driving to that area, by the time when you reach there the surge has gone down, and you just burn the gas and waste time. Try to learn which areas SURGE usually and stay in that spots. Most of time Uber offers guaranteed surge promotion in Toronto. What does it means? Guaranteed Surge is when Uber want to encourage the drivers to hit the road and make extra money. For instance, Uber offer 1.5 x surges in downtown from 6 am to 9am. So your $10 trip will be 10x1.5= $15. If the surge price is higher than the guaranteed surge you will always get higher surge rate. Uber send you notification time by time for promotions, you may also check in Uber app Earning-Promotions for upcoming or existing promotions. Driving with Uber is whole new experience, you may go to different places, the areas you never been there before. Picking the fastest route is very important. Either you can use your experience or depend on map. (Google Maps or Waze) Similarly there is no harm if you ask the passenger that which route they prefer. Sometime the rider go there on daily basis, they know which one is the best route. As we know gas and time are important factors, if you can save gas and time eventually you make more money. Moreover, instead of going small roads use highways and 407. It is known that you burn less gas on highways. 407 is best option in morning and afternoon commute, when the other highways are busy by using 407 you can save lot of time. But don’t forget to apply for transponder so you will not be charged for camera charges. As we mentioned gas / fuel is very important factor, if you save gas eventually you maximize uber earning. Use highways, skip traffic jam areas, press the accelerator gradually etc. Moreover, you should know which gas station has best price in your area. Usually 7-Eleven, Ultramar and Pioneer have the lowest price. But they don’t have their station all over the areas. We think Petro Canada and ESSO are the best options. Apply for their loyalty programs and get points or rewards. Petro Canada has the offer of 3c save on every liter of fuel and earn points faster if you pay with RBC linked credit card. Since when you start driving for Uber you may need more gas than usual. You can make lot of points, don’t use these points for car wash or pay for gas, because car wash and gas is expense which you can write-off when you pay taxes. Use these points for any other things. Check details at Petro Canada Website. Uber also inform drivers; you will get notification in Uber app or an email from Uber regarding upcoming event in Toronto and potential earning. The most important thing is to track your expense and mileage. Most of drives don’t realize the important of Uber taxes and ignore important elements such as write-off expenses and tax deduction. More you claim more maximize Uber earning. Therefore, it is very important to keep the record of all expenses and track your mileage. Keep the following receipts, fuel or gas, oil change, maintenance, water or gums etc. You will get your final tax document from Uber with mileage reported on that. But that only show the on trip mileage, it does not show the km you drove to pick rider and your way back home. Uber Annual Tax Summary with total income, HST collected on Uber Rides and on trip mileage only. Best practice is to write the odometer reading when you starting the Uber and once you done and reach home note the reading again. Moreover if you use Google Maps, you can check your daily mileage there. Open Google Maps and from the menu go to timeline. Checking mileage from Google Maps timeline. Also accessible through desktop version google map website. Lyft is officially launched in Toronto, the only uber's competitor in Toronto. Moreover, you can join Lyft as a driver in Toronto. when you have two options, you will wait less for rides. Furthermore, you will increase your income. For example, if Uber is not offering any promotions and Lyft is offering Lyft Streak Bonus, Lyft Power Zones and Lyft Prime Time then better to drive with Lyft. If you are currently an Uber driver and have not sign-up to Lyft yet, you will be able to receive $500 Lyft Driver Sign-up Bonus. 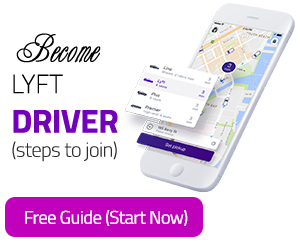 Become Lyft driver, start you application now steps to become lyft driver in Toronto.